Earlier this month we talked about the delights of foraging and encouraged you to make the most of the glorious autumn weather to go out in search of blackberries and elderberries. Not only is it great fun but incredibly satisfying too! So let’s now talk about two other autumn goodies which are in plentiful supply this year. The first is one you’ve probably noticed – they really glow in the sunlight at this time of year – but never thought about using, Rose hips. Surprised? Many people are, thinking of them only for decoration. 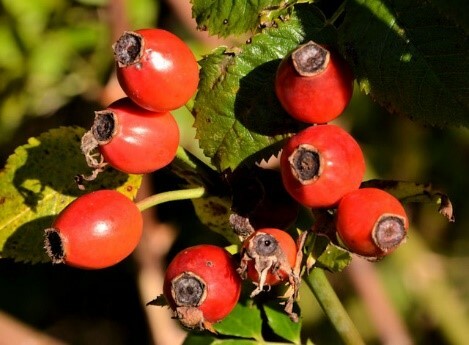 Rose hips are the fruit of the wild rose, also known as the Dog Rose. While thought of as a very english plant they can also be found in Europe, West Asia and Africa. Its beautiful flowers adorn the hedges and woods in May and June and have a surprisingly strong scent. Colours range from the softest white to darkest pink, with everything in between. Like blackberries and elderberries, rosehips are high in Vitamin C and other antioxidants. It’s often said that they contain much higher levels of Vitamin C than oranges, weight for weight; with figures of 20 to 60 times being quoted. Rosehips also contain Vitamins A, B, D, E and K as well as calcium, iron, manganese, magnesium, phosphorus, potassium, silica and zinc. They are a good source of fibre and provide about 160 calories per 100 grams. With their high levels of Vitamin C, it’s not surprising that rose hips were harvested and used as an alternative to oranges during the food shortages of WWII. Like elderberries, they can easily be made into a syrup – and the smell of roses when you do this is amazing – to be used for colds, flu, pneumonia and other winter bugs. And, if you don’t want to do it now, they freeze very well and can be used to make the syrup as needed. Once made, the syrup is best kept in the fridge. Alternatively, the hips can be dried and then crushed – in a pestle and mortar or food processor – and used to make a tea. Simply pour over boiling water, let it “brew” for a few minutes and then drink. Research has confirmed their anti inflammatory, anti oxidant, anti viral, astringent and diuretic properties. In recent years their high levels of Vitamin C, coupled with anti inflammatory qualities, have found them being used for Arthritis – and there are now several off the shelf products available for this. Rose hips can also be used to produce rosehip oil, well known for its high levels of Vitamin A and skin healing abilities. Not only can it assist in the healing of wounds and scars, but also cosmetically in nourishing the skin and so helping to maintain its elasticity. On a culinary note, rose hips can be made into a highly fragrant jelly, often used with meat and other savouries. And we must mention the school boys favourite use of rose hips – well their seeds actually – as a highly effective itching powder! Unlike blackberries and elderberries, rose hips are best picked after the first frosts when the hips have a slight “give” in them. And this applies equally to the other berry we would like to talk about, Sloes. So, be patient and keep an eye on the weather, you may have to wait a week or two until you can go in search of them! Sloes are the fruit of the blackthorn and, like the rose hip, can be found in Europe, West Asia and Africa. A wild plum, it’s well known for its lovely white blossom in May; which is often referred to as the “blackthorn winter” as it often seems to coincide with a cold spell of weather. Oh and don’t forget its vicious thorns, which can make gathering sloes a rather difficult process! Unlike the other berries and hips we’ve mentioned so far, there’s very little information to be found on the nutritional properties of sloes. Having said that, their diuretic and astringency properties are well documented. If you’re in any doubt then you only have to try to eat a sloe to find out why. You have been warned! 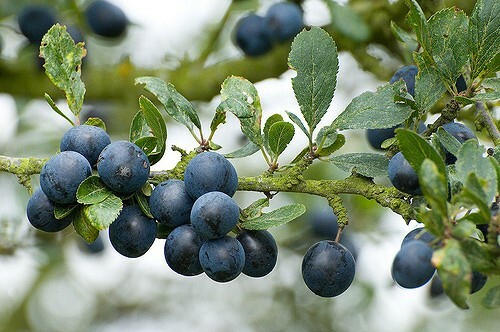 Their best known use hardly needs to be mentioned, sloe gin, although sloe vodka is becoming increasingly popular. It’s not difficult to make and, if you get a move on, will be ready in time for Christmas! Although it’s getting late in the season, there’s still plenty of time to go for a walk and see what goodies you can find in the hedges around you. It’s great fun and you never quite know what you’ll come home with! And if you thought autumn was the only time to do it, you’d be mistaken, there are always things to be found if you know what you’re looking for.